First week of school – check! 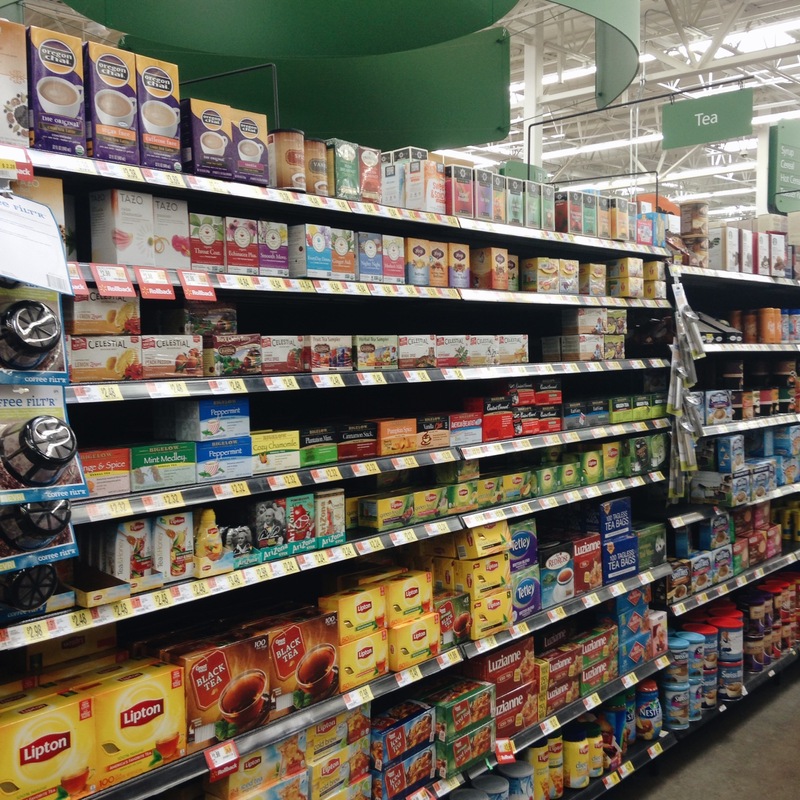 If you’re anything like me, back to school season has left you reeling … supplies, introductory projects, a new routine. September is a whole new kind of wild when compared to our summer adventures. And I knew the wild was on its way. But let’s be real, I’ve been in a bit of denial too. Because back to school means baby is getting closer and closer to arriving! In the back of my mind I’m constantly thinking of becoming a mom of three and welcoming a brother for my kiddos! Often I have to stop myself, bring this new reality to the forefront of my mind and just let it all soak in. For me, that’s the key. Being intentional. I have to choose to stop and focus on this sweet little one growing inside of me. Pretty much, I write it on my to do list and then, I know I’ll have some built in pause to the week; a chance to connect with my new baby before he is born. Today I wanted to share 8 ways I’m choosing to be mindful during this pregnancy; ways I’m taking a break to focus on this season of my life and the little boy who has already stolen my heart. My little guy loves the bath! I’m guessing the rushing water sound of the filling tub is soothing and the stillness when I settle in gives him a bit of calm that our normal routine doesn’t. He bounces around, I talk to him and am able to relax myself! On the spa note, I can’t say enough great things about prenatal massage. I found a gal who has a pregnancy pillow which allows me to lay on my stomach – such a treat! I’ve been on a real novel kick lately, but have paused to read a chapter in a textbook that I borrowed from my midwife. Pregnancy is so complex and I got a bee in my bonnet to learn more about placentas and all the work it’s doing to keep my baby healthy. I’m absolutely floored. Like, beyond amazed! You guys, Max has completed his TV detox and we now have a one show or movie allotment each day. He is so excited when this time comes and thus, settles right in. The kick off of his show gives me a moment to escape. 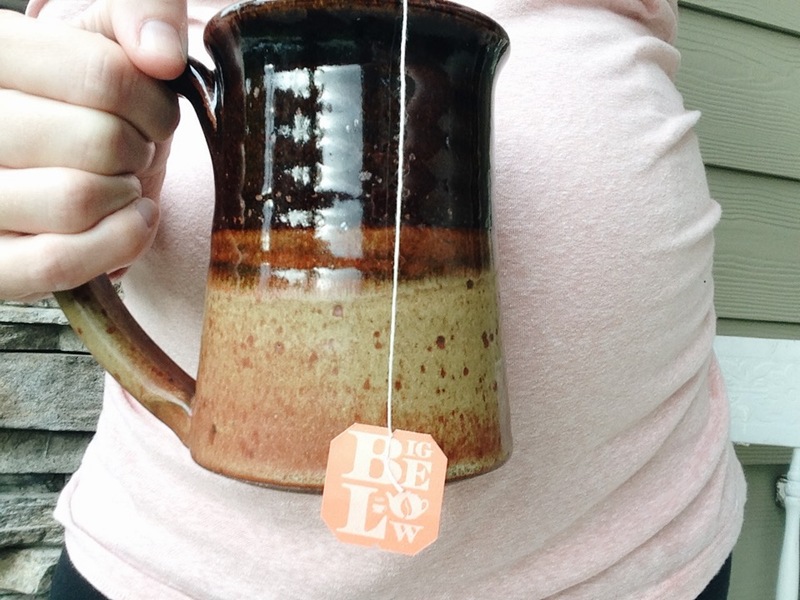 Lately it has been to the stoop on the front porch with a cup of Bigelow Pumpkin Spice Tea. Fall heaven. 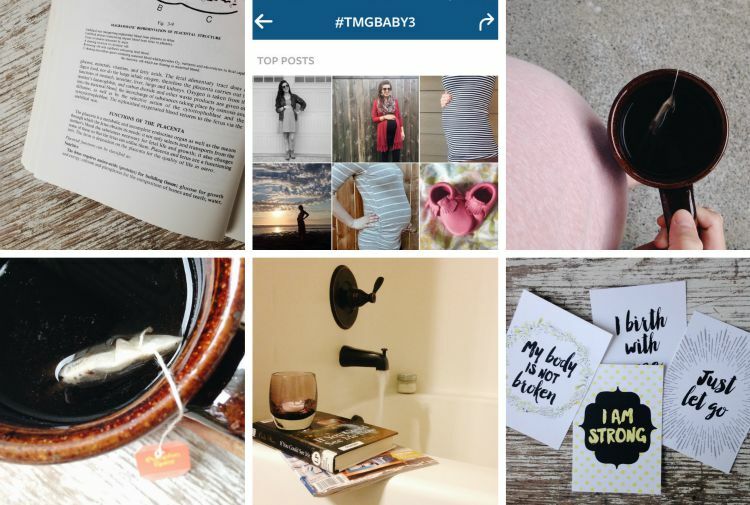 You’ve probably noticed my hashtag on Instagram, #tmgbaby3. I’ve been aiming to snap at least one photo each week dedicated to this pregnancy so I can print a Chatbook after he is born! Mom of three scrapbooking at its finest! I worry about the birth process. It’s not really my thing. Definitely the hardest part of my pregnancy. I think because I have so little control. So, intentionally bringing positivity into my mind in crucial! Meditations fall right into prayer for me. Prayers for a safe birth, health and all the little details of my baby’s life. At night, after I take my magnesium and layer on my sleep oil blend (essentials for pregnancy insomnia!) I drift off to sleep with my hand on my belly, whispering prayers for my baby. It’s a peaceful, quiet time that I treasure. I’m a mom, I clean a lot. Tea cups from my daily escape along with all the other dishes, mountains of laundry and the uncontrollable toy explosion in my living room. Lately, I’ve been popping some of our lullaby CDs into the kitchen nook CD player and grooving to baby tunes while I go about my work. Loving it! What helps you to pause during the day? Do you sip a cup of tea? 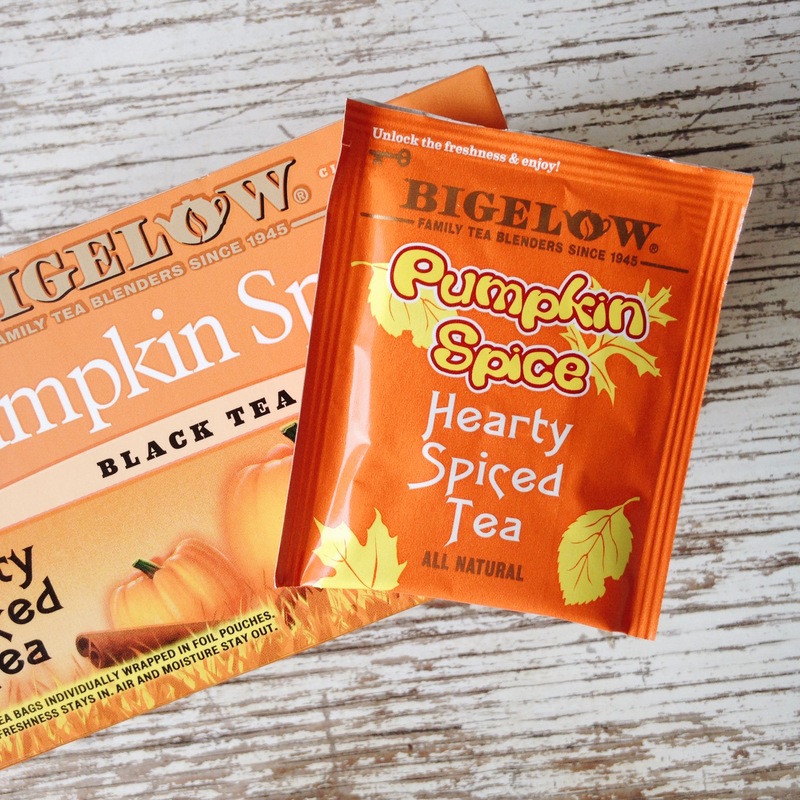 For real, try the Bigelow Pumpkin Spice – fabulous flavor, especially with a dash or two of cream! Do you pray? Sneak off to a bubble bath? I’d love to hear your tips … I have four busy months ahead of me and could use some extra ideas! 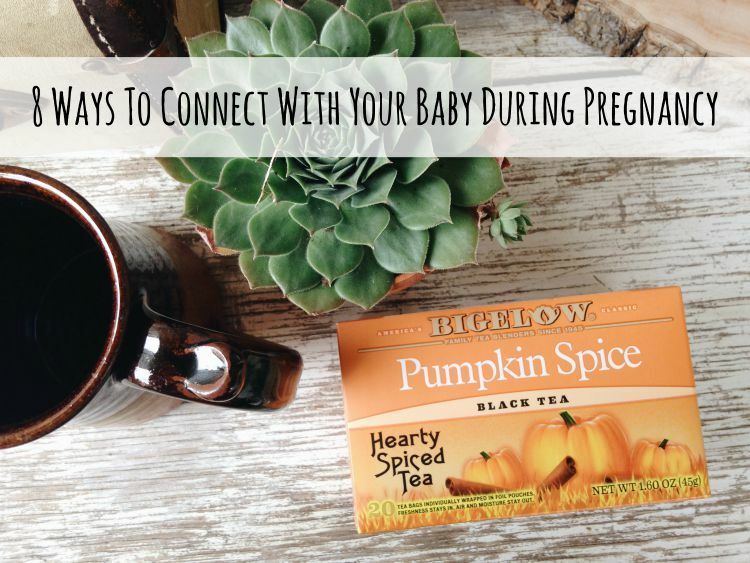 Bigelow Pumpkin Spice Tea was easy to find during my grocery trip to Walmart, right in the middle of the coffee and tea aisle! Pumpkin tea?! Sign me up!